I’m rather fond of the letter S, having lived with it as my first initial for quite a while now. It’s probably the letter I write more than any other, especially considering I have to sign my name or initials about 100 times a day at work. So while I wasn’t consciously setting out to make a bread whose main ingredients all share my initial, perhaps my ego was quietly asserting itself when, in an experimental frame of mind, I put a few ingredients together and came up with Semolina-Spelt-Sesame Sourdough. 4S bread. For a bread that contains not a single nut, this bread tastes remarkably nutty. 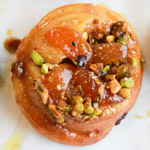 The nuttiness derives mainly from the hefty dose of sesame seeds, and also from the semolina and spelt flours. Smear it with your favorite fruit preserves and you’d swear it was a PB&J, except it doesn’t stick to the roof of your mouth. 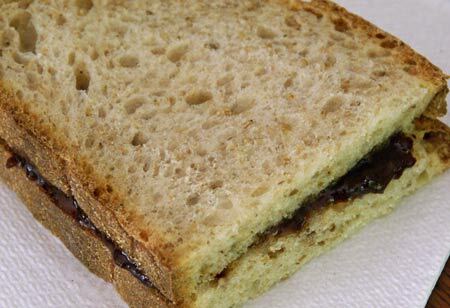 The bread is quite nice for sandwiches because the crumb is soft, thanks to the olive oil, and not too open, so you won’t get splotches of jelly all over yourself. 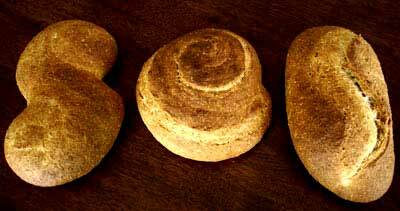 His remark was prophetic, because only the batard turned out to look very appealing. The spirals, maybe because I coiled them too tightly, didn’t open up and lost their definition. Fortunately, it all tasted good. But I suggest sticking to the batard. Or coil at your own risk. Spelt is an ancient cousin of modern wheat. Spelt flour is available in some retail food stores, or can be ordered from King Arthur Flour. In the bowl of a stand mixer, mix the flours, most of the water, starter, yeast, and salt on low speed until well combined, about four or five minutes. Adjust the water to give the dough a moderately soft consistency. Continue mixing in low or medium speed until the dough reaches a low level of gluten development, and another minute past that. Add the olive oil and continue mixing in low or medium speed until the gluten reaches a moderate level of development. The total mixing time may be about 10 minutes, but will depend on your mixer. Add the sesame seeds and mix in low speed just until they are evenly distributed through the dough. Transfer the dough to a lightly oiled container (preferably a low, wide one so the dough can be folded without removing it from the container). Ferment at room temperature (72F – 76F) for 2 hours (or about 2.5 hours if you have omitted the instant yeast), with a fold after one hour. Turn the dough out onto a lightly floured counter. Divide it into two equal pieces and preshape them into light balls. Cover the balls loosely with plastic and let them rest for 25 minutes. 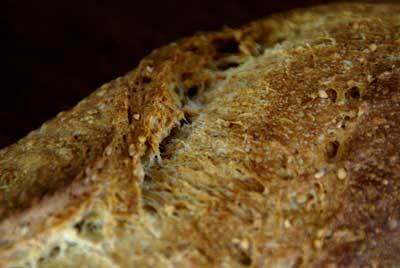 Shape into batards and place seam-side-down on a semolina-dusted board, or directly on your peel. Slip the board into a large plastic bag or cover the loaves loosely with plastic wrap. Ferment at room temperature for 2 hours (or about 2.5 hours if no yeast was used). 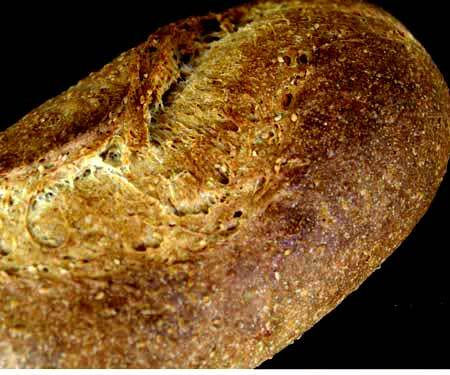 Slash each batard with a slightly S-shaped cut that is parallel to the long axis of the loaf. Once the loaves are in the oven, turn the heat down to 450F. Bake for 10 minutes with steam, and another 20 minutes or so without steam. The crust should be a deep brown. Then turn off the oven and leave the loaves in for 5 minutes longer, with the door ajar, to help them dry. ‘Sol’ stands for ‘Sun’ in spanish. Thanks a lot for your tips on making bread. I’m almost new to this and find them so interesting and helpful. That first photo is amazing. 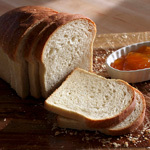 Rarely has bread looked so delicious! i was trying to figure out the 4 Ss too, and i don’t think i ever would have gotten it! that’s some tasty looking bread. i wish yeast and i were better friends. This looks so yummy! 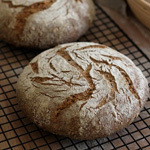 Your site is so inspirational to me – you’d never know that you haven’t been baking bread for years – everything you turn out looks so beautiful and professional, and this is definitely no exception! Barbara, welcome and thanks! I hope your guests enjoy it. Katy, it’s interesting how brand loyalties can be so fierce, isn’t it? If you’re ever stuck for flour and can’t find your favorite KA, I recommend giving Gold Medal Harvest King a try. Michelle, it’s never too late to make friends with yeast! Melissa, as you know, one week-long SFBI course adds years to one’s baking “experience.” So I cheated! I’m not excited to have to take a break from your site for the 8 days of Passover! I think I need to go find some spelt and semolina. Those loaves are tasty looking! You recommend coarse semolina? Is this the flour that is actually marked semolina instead of the more finely textured durum wheat? Looks great! I will have to try this recipe. i have been recently frustrated with my loves. On the second day they seem to fall apart so easily when trying to make a sandwich. 3 different recipes all had the same effect. I will try yours to see if that happens again. Hillary, I wish you a blessed Passover. Mimi, thank you. 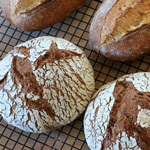 You should have no trouble finding these flours where you live. Abbey, my understanding is that the terms “semolina” and “durum flour” can both be used for either one, depending on what region of the country you live in. Here, yes, “semolina” refers to the coarsely-ground durum wheat (resembles fine cornmeal) whereas “durum flour” refers to the more finely ground one. In some areas it’s the opposite. Lori, hmm, are your loaves drying out? I’ll be curious to know how this one works for you. Lack of definition is minor when the taste test passed! I really have got to get into some of these more unusual flours! This one is beautiful Susan. I still haven’t figured out what semolina is in France. Do you know? I love bread with spelt in it. Jane, I don’t know! Any other French readers out there who can help? I think semolina is what we call “Durum vete” in Sweden, and the French might call it “blé dur” as far as I have been able to learn by googling. I just made this bread. Actually took my time and converted my sourdough to spelt sourdough. Discovered in a process that I was out of wheat flour of any kind. Took a risk and added 100 g barley and two tbsp of vital gluten to compensate. Added about 50 g sesame seed of two colors. Bread turned out super. I will definitely try again. Thanks for posting! I am so excited to have found your blog! Just took a wild yeast starter class this week and happened to have bought 5 lbs of semolina flour for lavesAND my husband and I have a dear fondness for a bread we used to buy but is no longer available with fennel, pine nuts and orange peel. Looking forward to trying the recipe!